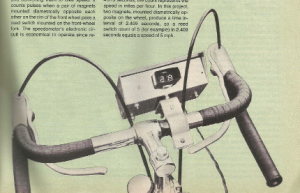 Following the build of our 1978 Metal Detector, next up in our Vintage Electronics series will be a Digital Bicycle Speedometer. In the March 1977 issue of Popular Electronics, they published an article for a digital speedometer complete with red LED displays. This will be a build from the original magazine which we have in TOG. You can get an LCD digital bike speedometer nowadays for as little as 5 euro. These multi function devices can do much more than speed. Back in 1977 however, this thing must have been space age….. red LED displays and all! We think it will look suitably retro on a modern carbon fibre road bike 🙂 We will be building the speedometer over the next few weeks. Come in and join in the build, or keep in touch with the build online. This was written by gary. Posted on Friday, July 31, 2015, at 7:00 am. Filed under Project, Workshops/Events. Bookmark the permalink. Follow comments here with the RSS feed. Post a comment or leave a trackback.